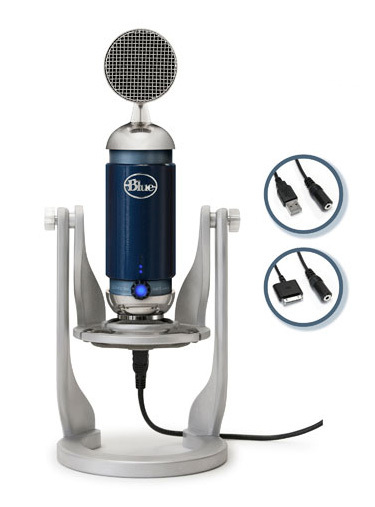 Spark Digital, USB microphone from Blue Microphones. Blue Microphones announces the availability of Spark Digital, the studio condenser microphone offering both iPad and USB connectivity. 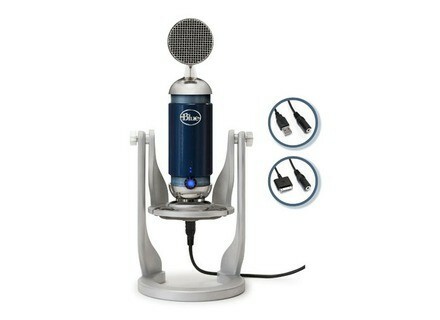 The digital version of Blue’s analog Spark microphone, Spark Digital delivers audio to iPad or a computer, laptop or tablet with USB input. Spark Digital features the same condenser capsule and components as the original, analog Spark. Spark Digital is also suited for a range of situations: vocals, guitar, drums, podcasts, piano, location recording and more. Spark Digital also features studio controls on the microphone including volume and gain control, and instant mute. In addition, Spark Digital is an iPad microphone offering a zero-latency headphone out for direct monitoring. Spark Digital also employs a Focus control, providing two different sonic options in one mic. ‘Focus Off’ is designed to capture "crisp, powerful audio with enhanced low frequency sensitivity," and ‘Focus On’ to capture "greater clarity and detail for a tighter, more focused sound," according to Blue Mics. Spark Digital comes with a custom angle-adjustable desk stand with built-in shockmount. For each platform connection (USB and iPad), Spark Digital includes a y-cable with an attached, extended female headphone jack for direct monitoring. Spark Digital iscompatible with iPad (3rd generation), iPad 2, iPad, iPhone 4, iPhone 4S and is recognized for use with any recording app, in addition to driverless connection via USB on both PC and Mac. For storing and sharing, Spark Digital also includes an Cloud Production Bundle with free access to production tools for organizing, storing and streaming of audio content on the web. Spark Digital includes a 25 GB storage and transfer account for six months from Gobbler, the music backup and organization service, along with a six month Pro Account from SoundCloud. Spark Digital, MSRP $199.99, is now available in-store and online at Apple and Best Buy, and arriving soon at Guitar Center, Amazon and additional consumer electronics and pro audio retailers. Shadow Hills Industries Oculus Shadow Hills introduces its Oculus Monitor Controller system, made of the "Pendant" controller and the Base Station.